For those of you who like to know just how cold and windy it really is, the Kestrel 2000 Pocket-Anemometer is your reality check. Whether contemplating which wet suit the cold water warrants, or checking to see how low the wind chill can go in the blind, the Kestrel 2000 is the easy-to-use tool you need. Winter sports enthusiasts around the world love Kestrel Meters. 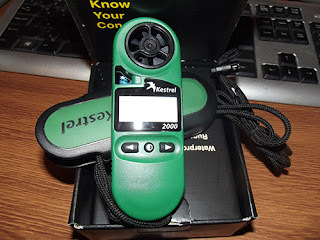 Thanks to the patented external temperature sensor, the Kestrel 2000 Pocket-Anemometer can take accurate water and snow temperature readings, and since it is isolated from the case, you can be sure that the temperature the Kestrel Meter is reading is accurate and not influenced by your hand warming the unit. Kestrel Meters kept riders and spectators abreast of the weather conditions at the 2006 ESPN X Games in Aspen, Colorado, and were used by the 2006 US Biathlon Olympic Team in Turin to measure air and snow temperature to aid in ski-wax selection decisions and measure the wind downrange.